Structural Engineer: Harriott Valentine Engineering, Inc. The Hangar and Town Green provide a year-round focal point and a symbolic living room for the city. Located in the heart of downtown, the complex galvanizes the civic heart of Kenmore and touches upon the primal notions of gathering, creating a venue for passive and active recreation while ensuring a home for nature in the rapidly growing community. The Town Square provides an important link between existing civic buildings including the City Hall and Library with updates to enhance walkability and the overall pedestrian experience. This public project has proven to be a catalyst for private development while also creating a shared public amenity where citizens are encouraged to take ownership through a variety of community and social events. The Hangar building sits within the Town Square and is designed to morph depending upon weather or functional requirements. Simple and large, the space opens to the Town Square via a 24-foot-wide by 16-foot-tall bi-fold window wall. 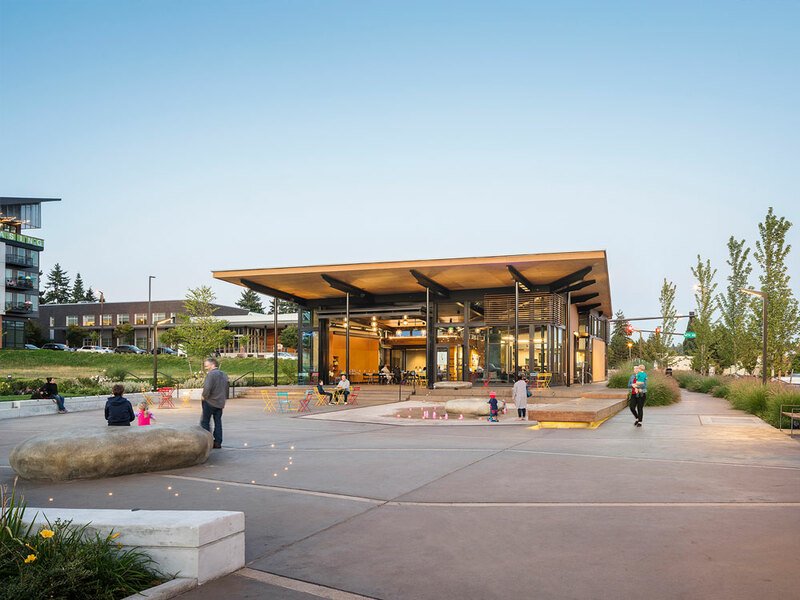 When open, the large roof overhang provides protection from rain and sun and enables parents easy access to their kids playing in the adjacent plaza. The inverted roof lifts up from the building to gesture toward the park and adjacent thoroughfare, with the residual gap between building and roof becoming a dramatic clerestory. At night, the extensive glazing transforms the shelter into a lantern and beacon for the community. The plaza design recalls Kenmore’s natural and cultural history with forms and features reminiscent of skipping stones in calm water. This effect is reinforced by generous swaths of natural grasses and a large dock-like wood element. An interactive water feature and heated rocks encourage people to visit and linger in all seasons. Etched granite inlays in the plaza paving provide the history of Kenmore. Inside, the structure includes a partitionable, multi-use assembly space for public gatherings, music performances, dance and fitness classes, movies, and more. A café space offers food and beverages, while activating the interior and exterior space throughout the day. Wood cabinetry lockers are integrated into the space to provide storage for community groups and activities such as yoga, club meetings, etc. The facility includes a see-through, double-sided fireplace and hearth composed of concrete, mild steel and milestone. The polished concrete floor is hydronically heated and, paired with the operable window walls and super-sized building fan, ensures a comfortable building environment throughout the year. Simple, durable low-maintenance materials include exposed plywood SIP panels, steel structural beams and columns, clear cedar siding, aluminum storefront windows, and a standing seam metal roof. Stormwater mitigation is achieved through a green roof with drought-tolerant landscape and high-efficiency irrigation. The building encourages responsible design by meeting the 2030 Challenge for energy reduction by optimizing the building envelope, mechanical, and electrical systems.